Although many Americans fear outliving retirement savings, many more are failing to hit 401k contribution limits and get full employer matches. Every year, the typical U.S. worker misses out on an average of $1,336 in missed employer contributions. Find out why so many Americans are leaving money on the table, and how you can maximize your 401k savings. In 2014, the average U.S. worker missed out on approximately 2.4 percent of their annual income by not maximizing their 401k employer match, according to a study by Financial Engines. Over the span of 20 years, each worker is missing out on approximately $42,000 of free money from employers. Among Americans alone, that amounts to $24 billion every year. Worse, Americans have made a habit of missing out on matching contributions. More matching contributions were unclaimed in 2014 than matching — 40 percent more, in fact. And while Americans are living longer, their savings are falling short. Industry experts estimate the U.S. has a retirement shortfall that ranges from $4.13 trillion to $14 trillion. To live comfortably in retirement, you will need between 75 percent and 80 percent of your preretirement income to sustain yourself in your retirement years, according to U.S. News. According to GOBankingRates’ 2015 Life + Money Survey, young millennials find paying for higher education their biggest financial hurdle, meaning they might be forgoing retirement savings in lieu of loan payments. Meanwhile, 1 in 3 baby boomers said saving for retirement was their biggest challenge. No doubt, the older you are, the more likely you will max out your 401k employer match. Only 16 percent of Americans age 60 and older will be missing out on employer contributions, compared to 30 percent of employees age 30 and younger. Unfortunately, your younger years are the most important time for growing retirement savings. Although saving money is an important first step to a healthy retirement, many workers make the mistake of saving a dollar amount every paycheck. Ideally, you want a percentage of your income taken from your paycheck to ensure you are getting a full match on your contributions. As you get pay raises over the years, your contributions will also increase, ensuring you never fall behind on savings. Unfortunately, those who earn less money, save less. 42 percent of participants who earn less than $40,000 a year fail to maximize their employer match, compared to just 10 percent of employees with annual incomes over $100,000, according to Financial Engines. If you’re uncertain of how much money you should be saving for retirement, Vega suggested saving “as much as you can afford.” With Americans living longer and uncertainties surrounding Social Security, saving for retirement is detrimental for the average worker. You should try to save between 12 percent and 15 percent of your income. Sharon Epperson of CNBC suggested saving as much as your current salary by age 35. By 55, you should have at least five times your salary saved. By placing your savings in a 401k, you reduce the income tax on your take-home pay. Having $100 taken out of your income for your 401k will only reduce your paycheck by about $60 to $80 per month because of the tax benefits you gain, depending on your salary and tax bracket, according to CNN Money. The younger you are, the less you need to save, and the greater the effect of compound interest. 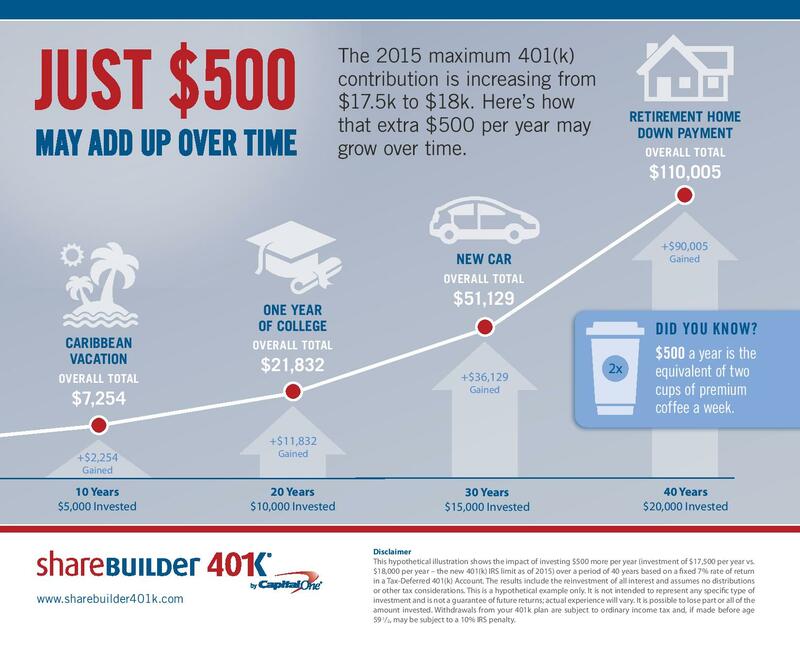 Stuart Robertson, president of Sharebuilder 401k, showed how saving just $500 more per year — the equivalent of two cups of premium coffee per week — can help an individual in their 20s amass over $110,000 in retirement savings. He also emphasized the urgency in starting retirement savings as soon as possible. “Over the course of a 40-year career, delaying sensible, diversified investing by a few years or paying an extra 2 percent in fees can translate to hundreds of thousands of dollars in lost retirement savings,” Robertson said. In short, it’s better to start saving sooner rather than later, and ensure you’re not paying too much in fees. Employees with access to financial professionals tend to miss out less on 401k employer matches, according to Financial Engines. Only 15 percent of employees using advisory services missed out on 401k employer matches, compared to 26 percent of employees who did not use such services. According to Capstone Wealth Partners, nearly 50 percent of U.S. companies provide self-directed brokerage accounts (SDBAs), which offer employees greater options for investing, plus the services of investment professionals. If you’re unsure of how to approach retirement savings, or you’re sure you could be saving more, you can also reach out to a CFP. A financial planner can help you trim the fat off your monthly expenses and get you on the fast track to retirement. No matter how you approach retirement savings, make a concentrated effort to include it in your monthly budget. If you’re dragging your feet, reach out to a financial professional. At any age and income level, individuals who consult a retirement professional are consistently better off. Max Out Savings: Find out how your 401k is designed and save, at minimum, the required amount to get your full 401k employer match. The typical match among U.S. employers is 100 percent of each dollar, up to 6 percent of income, according to Financial Engines. Get Professional Advice: Take advantage of free investment advice from your employer. Ask them about 401k fees and learn the ins and outs of your investment options. Contribute a Percentage of Your Income: Commit to saving a percentage of your income rather than a dollar amount to build wealth as your career progresses. Men Vs. Women: Who Has a Better Work-Life Balance? Know what to do for a 401k withdrawal to avoid penalties.